P/LINEAR imaged by Xingming Observatory 0.35-m SASP telescope on May 18.69 (UT). The image is roughly 18’x6′. Imaging by Quan-Zhi Ye and Xing Gao, reduction by Man-To Hui. Same image above but with different enhancement technique. My old friend Man-To Hui has sent me the processed version of P/LINEAR that I took using Xingming Observatory‘s 0.35-m SASP telescope on May 18 (I was too busy to process the images, and Man-To is a real expert in image processing!). The image you see above is combined from 55 frames with a total exposure time of 83 minutes. Hey, look at that! 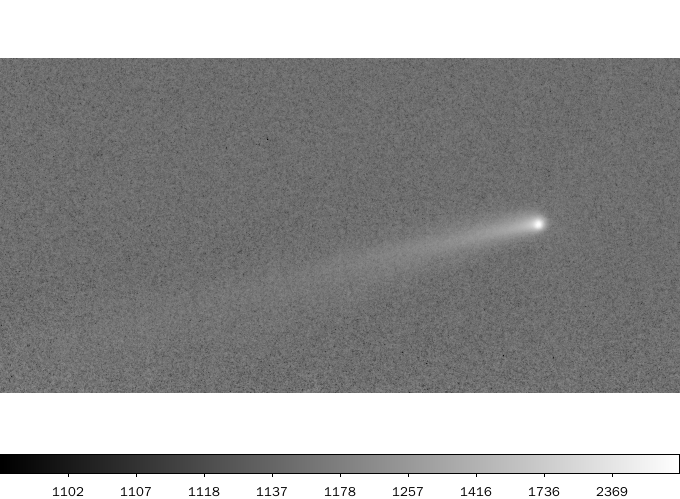 Despite the guiding issues (which did not center the comet) we are missing some of the tail, but I can tell the tail is at least 15’ long. Not bad for a tiny comet that is said to be dying. Man-To and I think we are seeing a possible secondary tail just down to the longer, primary tail, but it may just be illusions. 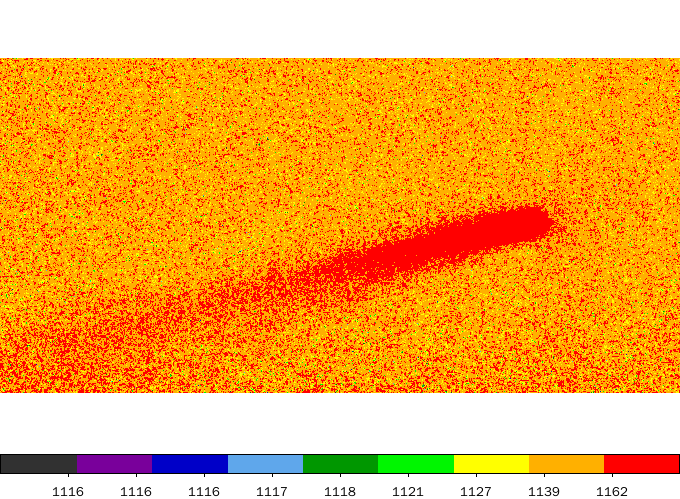 Synchrone simulations by Man-To do not support the idea of a secondary tail, but in a few days we are crossing the orbital plane of the comet, which gives us some advantages on detecting the “dust trail” (not tail) of the comet, i.e. the old meteoroid clouds released by the comet long ago. I will be working with the two Gemini telescopes and the Xingming facilities on that purpose. Lots of work over the weekend! Meanwhile I am excited to see David Asher just posted his prediction of the meteor shower. There are a bit more information in the powerpoint prepared by Robert McNaught, but the website has all the “core” information. According to David, the Earth will take the direct hit by 22-rev (released in 1903) at 7:09 UT and 47-rev (released in 1778) at 7:47 UT. A lot of other trails will have a near miss (rE-rD<0.0001 AU). For the case of 1999-2002 Leonid storms, anything around or below 0.0002 AU or so are very, very interesting (c.f. McNaught & Asher 1999). Unfortunately P/LINEAR is pretty much dead comparing to the parent body of Leonids, 55P/Tempel-Tuttle, but I just realized that P/Tempel-Tuttle is not huge — only 3.6 km according to JPL data — thinking about the most recent report that P/LINEAR may be much larger in size, it gives me a remote hope that maybe P/LINEAR was by a fraction comparable to P/Tempel-Tuttle in the distant past? Although, the pessimistic scientist would have told me that P/Tempel-Tuttle has a longer orbital period than P/LINEAR and should preserve much more volatile materials. Any ejecta from P/LINEAR should have been long-buried into the zodiatic background. If P/LINEAR was ever active recently we should have seen a moderate annual Camelopardalids shower (in off-storm years, the ZHR of Leonids is actually around 15), but we aren’t even sure if the annual Camelopardalid shower exists! If you want to be optimistic, think about Draconids. Its parent, 21P/Giacobini-Zinner, has a similar orbital period (6.6 yr) to P/LINEAR (5.1 yr); the encounter speed is also similar (20 km/s for Draconids, 16-19 km/s for Camelopardalids). Even the names have some sort of similarity (dragon vs. giraffe + camel + leopard hybrid). In 1933 and 1946 we had two gigantic Draconids storms (ZHR~10000) that even overshadowed all Leonids storms (except the one in 1966), with zero direct-hit in 1933 and only one direct-hit in 1946 (c.f. Maslov)! Draconids are also very quiet in other years, almost non-detectable. 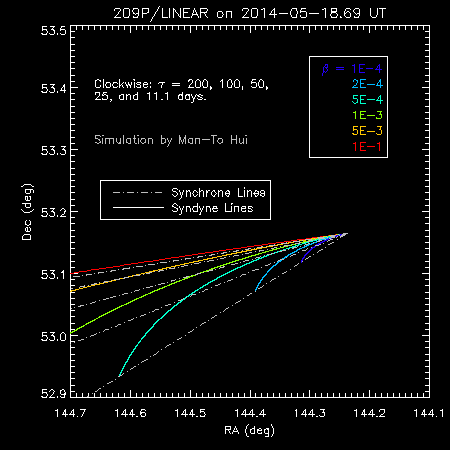 Of course, P/Giacobini-Zinner is a bit more active (OK, in fact it is by a magnitude of 3 in terms of Afrho). But since we have so many encounters all at once, even P/LINEAR was only one magnitude more active in the past, we should still have quite a show. UPDATE May 22: according to Peter Jenniskens, the Goldstone radar has detected the nucleus of P/LINEAR. I think I read somewhere that the lower detection limit is 1 km, so this indicates that the nucleus is larger than 1 km, which converged with the earlier reports by Carl Hergenrother. More calculations here. The window for Arecibo is May 23-27, so we should have more news coming in in a few days. The comet will be closest to the Earth on May 29, provides a very good opportunity for both radars. This entry was posted in Research and tagged camelopardalids. Bookmark the permalink.